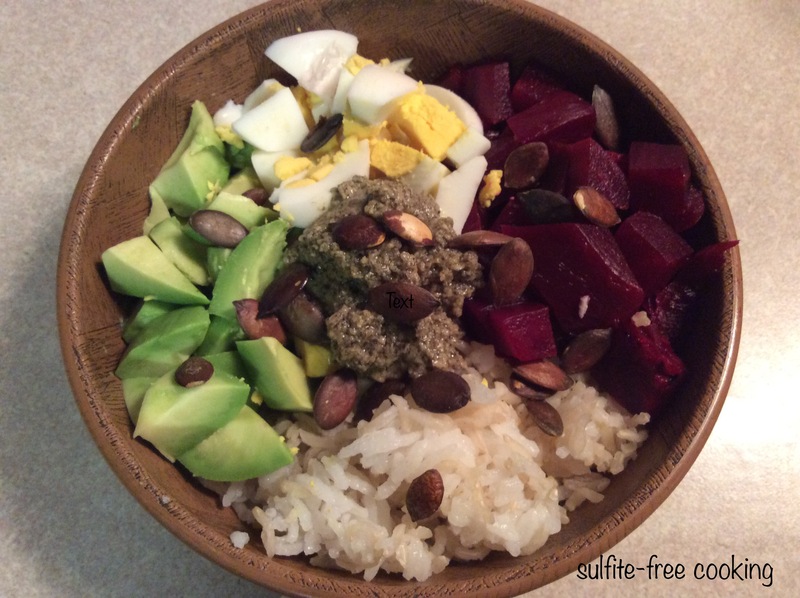 Depending on your tolerance level in regards to natural sulfites, you may or may not want to make this veggie bowl. My Significant Other is pretty lucky as far as this goes : he can eat beets, eggs, endives and even a small amount of broccoli. Not his favorite foods though (except for eggs)… maybe his body knows what is good for him ??? Anyway, even if you think you shouldn’t make this veggie bowl as is, I invite you to see how I make the dressing that I very often use on lettuce and avocado, as a substitute for the traditional « vinaigrette » I used to make ! It is also much healthier than any of the typical dressings you can buy in American stores : to tell you the truth, I was shocked to see that almost every bottled dressing there contained some kind of sugar ! Knowledgeable people such as Doctor Lustig and Doctor Hyman, backed by the latest research, are warning us that all calories are not equal and we should be a lot more careful about the amount of sugar we ingest, than the amount of fat… provided it’s « good » fat. 8 TBSP uncooked rice, whichever kind you like best : basmati, thai, regular. I often have to negotiate so that at least half of it is whole-grain ! I always steam our rice, for about half an hour. Sometimes I also remember to soak it for a few hours before steaming, which is supposed to make it easier to digest. 6 TBSP finely ground pumpkin seeds (Vacationing in the U.S. at my children’s place, I used an immersion blender to grind them, it worked just fine. Back in France I have a very old but very handy electric coffee grinder, it’s perfect!) + 2 TBSP rice vinegar (feel free to use a different kind of vinegar if you are not sulfite-intolerant) + 2 TBSP olive oil + 1 to 2 TBSP water + ½ tsp natural sea salt. A FEW MORES WORDS ABOUT THIS DRESSING: you can double the amounts, or thin the dressing with more water, and even use a different kind of oil (canola oil is a good substitute). Start with the pumpkin seeds and the vinegar so as make a paste the consistency of mustard. Then you can go on with the oil and the salt, and finally add as much water as you like. Spoon the cooked rice, then the eggs, then the avocado, then the beet into each bowl. Sprinkle with the toasted seeds, and add the dressing in the center. We have found this veggie bowl to be quite filling !